Mulka Station is a pastoral lease that operates as a cattle station in the far north of South Australia. 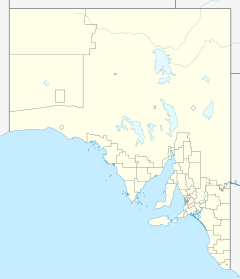 It is situated approximately 154 kilometres (96 mi) north of Marree and 216 kilometres (134 mi) west of Innamincka. The property is found to the south of Clifton Hills Station and is the driest permanently occupied pastoral holding in the country with annual rainfall of about 10 centimetres (4 in). The main vehicular access the property is via the unpaved Birdsville Track. The property is currently owned by Garry Overton and it occupies an area of 5,600 square kilometres (2,162 sq mi). Both Lake Hope and Red Lake are situated within the station boundaries. Established prior to 1889 the property used to be stocked with sheep. In 1889 the owner was James White who sold Mulka along with Canatalkina Run which together occupied an area of 804 square miles (2,082 km2) and was stocked with 6,000 sheep. George 'Poddy' Aiston acquired Mulka in about 1923, he had previously worked as a policeman at Mungerannie after returning from the Boer War in 1902. By 1925 he had built the Mulka Store near the Mulka Bore along the Birdsville Track. The store was the only one in an area of approximately 70,000 square miles (181,299 km2) and carried the broadest range of stock imaginable. The Mulka Store Ruins are listed on the South Australian Heritage Register. Drought had gripped the area in early 1929 with George Aiston predicting that if it did not break by the end of 1929 then the area would be desterted by both Europeans and Indigenous Australians. From 1933 to 1934 the 475 square miles (1,230 km2) property was struck by drought again with Aiston being unsure if his 1,000 head of cattle were even alive. In late 1934 the property was struck by dust storms and then rain with the creeks flooding. George Aiston died in 1943 but his wife Mabel remained running the store until 1951. Airmail delivery to remote properties in outback South Australia, New South Wales and Queensland commenced in 1949. Mulka along with other remote properties including Mungerannie, Clifton Hills, Glengyle, Davenport Downs, Morney Plains, Mount Leonard, Durrie, Cordillo Downs, Tanbar, Durham Downs, Nappa Merrie, Lake Pure and Naryilco were also on the route. In 2005 drought condition were so bad that the property was completely destocked. By 2010 the rains had arrived further north so that Cooper Creek was flowing again as far as Lake Eyre. Gary Overton, the station owner, got to use his fishing licence to start catching Lake Eyre Golden Perch in the waters of Lake Hope. The licence allows the removal of 350 tonnes (344 long tons; 386 short tons) of Lake Eyre Golden Perch, Welch's Grunter and the Barcoo Grunter but only once the lakes have disconnected from the Cooper Creek after a flood event. In 2012 floodwaters returned allowing Overton to net up to 5 tonnes (5 long tons; 6 short tons) of fish per week which were trucked to Adelaide, with ice being brought back on the return leg. The station was also stocked with approximately 3,000 head of cattle. The land occupying the extent of the Mulka Station pastoral lease was gazetted as a locality by the Government of South Australia on 26 April 2013 under the name 'Mulka'. ^ "Blazing saddles". The Age. 11 June 2005. Retrieved 22 August 2014. ^ "The Birdsville Track". Outback Australia. Retrieved 23 August 2014. ^ a b "Desert fishing business booming". The Adelaide Advertiser. 8 April 2012. Retrieved 23 August 2014. ^ "Cattleman nets Yellowbelly". The Courier Mail. 9 April 2012. Retrieved 23 August 2014. ^ "Sale of Sheep Stations". South Australian Register. Adelaide: National Library of Australia. 1 August 1889. p. 4. Retrieved 23 August 2014. ^ "Vast inland spaces". The Chronicle. Adelaide: National Library of Australia. 25 June 1936. p. 7. Retrieved 23 August 2014. ^ a b Mike Dash (25 June 2012). "The Loneliest Shop in the World". Smithsonian. Retrieved 23 August 2014. ^ "Mulka Store (sometime Scobie Homestead) Ruins". South Australian Heritage Register. Department of Environment, Water and Natural Resources. Archived from the original on 15 February 2016. Retrieved 12 February 2016. ^ "Advertising". Camperdown Chronicle. Victoria: National Library of Australia. 18 July 1929. p. 4. Retrieved 23 August 2014. ^ "From Far Places". The Argus. Melbourne: National Library of Australia. 3 October 1934. p. 6. Retrieved 23 August 2014. ^ "Out among the People". The Advertiser. Adelaide: National Library of Australia. 22 November 1934. p. 17. Retrieved 23 August 2014. ^ "Airmail Service For Outback Stations Commences Next Week". Barrier Daily Truth. Broken Hill, New South Wales: National Library of Australia. 15 April 1949. p. 1. Retrieved 23 August 2014. ^ "SA's pastoral country greens up". Australian Broadcasting Corporation. 26 May 2010. Retrieved 22 August 2014. ^ "Management Plan for the Lake Eyre Fishery" (PDF). Primary Industries and Regions South Australia. 1 March 2013. Retrieved 22 August 2014. ^ "Search result for "Mulka (LOCB)" (Record no SA0067138) with the following layers selected - "Suburbs and Localities" and " Place names (gazetteer)"". Property Location Browser. Government of South Australia. Retrieved 22 September 2016. ^ Proposed Locality Boundaries for Pastoral Areas (PDF) (Map). Government of South Australia. 31 October 2012. Rack Plan 951. Retrieved 5 September 2015. This page was last edited on 8 February 2018, at 00:41 (UTC).